We are known for our innovative products & Inspirational team! Veevo Tech is backed by a dedicated young team of like minded people aiming to change the lives with technology returning the ease and standard in life! The company basically engaged in IT & Telecom VAS Business also own Pakistan's first largest Social Service - "Smile Network" where Smile is being used by over 3.4 Million people across the nation. Smile worked independent of Internet, empowering people in faraway villages to stay online with information availability, which was highlighted on National & International Media! Veevo Tech holds years of experience in IT & Telecom field which includes biometric technologies, scalable load-intensive software designing, SMS/Robo Calls solutions, state of the art security solutions etc. We are excited to announce that we have extended our services to international market by launching in Ghana and soon extending to other African countries. Our complete range of products and services can be availed by customers in Ghana now. A state of the art technology to help educational boards manager their exams being conducted across the region in hundreds of centers from one central point. We strengthen the boards to effectively monitor the examination staff and track their duties with digital tools - EMRT has been a success and implemented in all boards of Khyber Pukhtunkhwa province of Pakistan which is inaugurated by education adviser to CM. Veevo Tech joined hands with Khyber Pakhtunkhwa Finance Department to revamp Pakistan's provincial budgeting process to new heights, where VT helped to conduct a massive survey among 3 million Mobile Phone users across the province to seek opinions geographically on what sector to spend most of the budget in that specific area and what tier of Govt. should spend this budget. Veevo Tech launched a next generation product to digitize clean drinking water, where the water supply and quality is monitored and ensured using specially designed hardware and software, with real-time information like Water Flow measurement, Quality like pH, Turbidity etc are directly replicated at Dashboard from across the region. We are calling it Smart Water. VT launched Electronic Detailed Marks Certificate (eDMC.Pk) a need of time innovative product to facilitate students earlier than before while helping educational boards seamlessly operate in paperless and hassle free environment, it's available at www.eDMC.Pk with builtin electronic payment processing gateway. VT signed agreement with Gunj Glass one of the pioneer industry in Glass production in Pakistan to digitize their six branches manual HR operations using our HR automation product Empleado. VT signed agreement with Peshawar board to take it's result declaration to next level using its newer technology of paperless result services. Results can be checked instantly by sending BISEP space Roll# on 8583. Veevo Tech signed an MOU with ETEA to digitize the process of mass recruitment at Govt. level, ETEA is Govt. of KP autonomous body responsible for conducting educational testing. VT joined hands with NUST for deployment of one of our product Empleado at its various campuses to improve staff efficiency in terms of attendance, the company will be installing its branded state of the art facial recognition biometric machines for attendance monitoring. In simple we are calling it EDN! 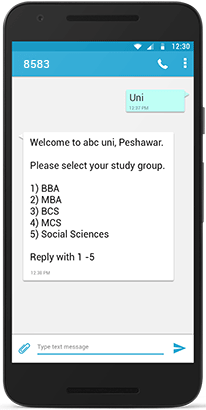 It is simple, light, Web based automated system for Schools / Colleges, to help them in communication with Students via SMS! It comes with saftey notifications - an Alert is sent to Parent on child arival/exit. Digitize your School operations today with Scholastic. Scholastic comes with its own SMS, Biometric & Teacher, Parent Mobile Applications. Empleado is designed for diverse organizations to automate their HR Operations. Web Based Biometric integrated System that helps you connect branches to manage your HR, Attendance, Recruitment, Payroll & much more in a new way. In simple we are calling it PES. A comprehensive complaints handling system for Private & Public sector, designed to automate complaints coming through various mediums, i-e SMS, Phone, Walk-in or in Hard concerning to multiple departments. Community page is awarded with the most powerful brand fan page that exists today! CP empowers all your socially required features through SMS, letting you send updates via SMS & get Likes/Comments & much more via simple SMS. How do you hear your crazy followers when your telephone lines are all busy during your TV/Radio show ? Downtimes or excessive load is killing your web site? Try Veevo Business Class Managed Web Hosting with dedicated & guaranteed hardware resources, Fuel up your site with 5x more speedy loading of content, with guaranteed uptime. Planned an application for masses? 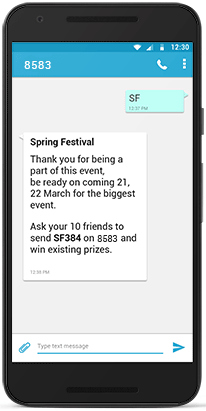 Internet limitancy might be killing your idea, use our two-way SMS API to create robust application and reach masses without hassels on their cell phones! A Simple RESTFul API can be integrated in any application, send OTPs or other Notifications instantly. Robo Call - in simple Robotic Call is an automated computer generated call that reach targeted Mobile Subscriber's phone and starts a pre-recorded voice upon the call is received by subscriber. Best for promotional / Awarness campaigns among masses with lower literacy rate. In today's Fast-faced world, you can never ignore the importance of a Mobile Phone because it always move along! Reaching your target customer's pocket can make your turnover craziest as the subscribers stands at 135 Million in Pakistan, it's a huge market. We leave no stone unturned to make your online presence a reality, our creative designers love to make your identities a lot more beautiful and attractive for more corporate touch and business progress. Alongside we create fully dynamic websites to fit your customized requirements. Thought to ignore Mobile apps ? Indeed a poor idea, the world is moving towards smart phones with an unmeasured speed, extend your operations on Mobile apps today! Our creative agency helps you develop blazing fast Mobile Apps. Smile is a social networking service powered by Veevo Tech, the first of its kind service that let people to go socialize without even Internet & Smart Phone! Smile is connecting 2.1 million happy Pakistanis together! The Most Powerful Social Media Fan Page! Running a fan page on social media with poor results? Reach 100% of your connected customers as compare to other social media platforms. Set a dedicated & customized welcome reply for your subscribers/customers. Send updates to your customers via an easy web interface. 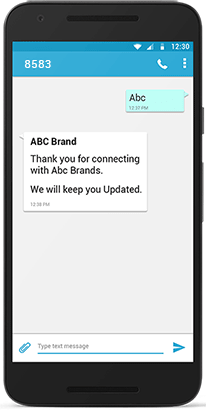 Send personalized updates, Call your customers with their names. 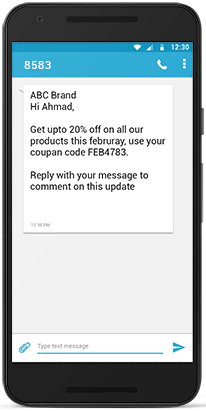 Generate automated coupon codes, go viral using built-in SMS Based referral system! Powerful reporting/analytics, to know gender wise/location wise subscribers etc. Fazal Arcade, F-11 Markaz, Islamabad, Pakistan. Jawad Towers, University Road, Peshawar, Pakistan. Copyrights © 2019 Veevo Tech. All rights reserved.